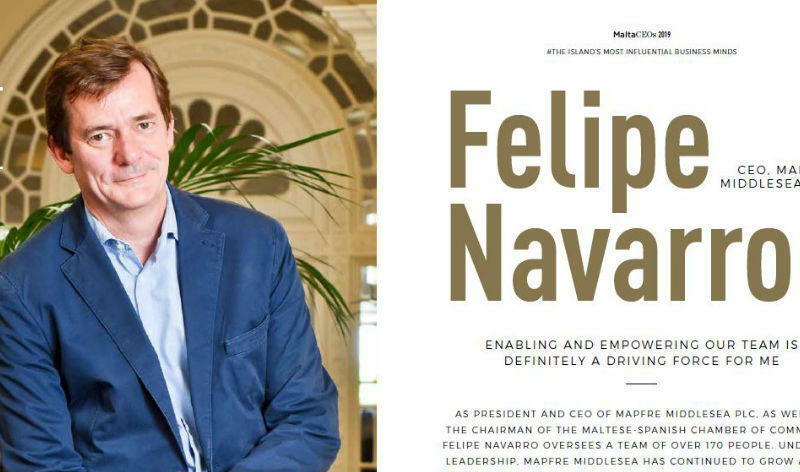 At an interview for Malta CEOs 2019, Felipe Navarro outlined the characteristics of a good CEO, the operations of the company in the Maltese sector, and where MAPFRE Middlesea is headed in the future. MAPFRE has been operating in Malta since 2011, when it acquired 54.56% of the shares of Middlesea and, since then, it has become the largest insurer in the country, leading in the Maltese Life and Non-Life sectors. Felipe Navarro has headed the company since 2012, following an innovative plan focused on the long range. In the interview, he explains that with the appearance of new technologies, the sector will be more profitable, with more rapid processes, better strategies, and more sophisticated pricing approaches. As regards the future of the company in this changing environment, the CEO confirms that it will continue to lead the market, providing stable results. One of the fundamental factors in achieving this goal lies with our workers. For Felipe, empowering and validating workers is key in achieving good results. In his opinion, being CEO of a company is working to ensure that the team understands how things can be improved and providing solutions, not just setting up rules.